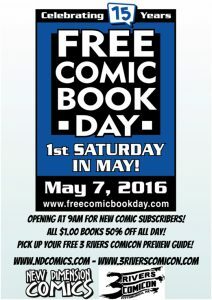 FREE COMIC BOOK DAY 2016 Coming May 7th to all NDC stores! FREE COMIC BOOK DAY is a great day to check out new samples of great titles from all publishers big and small! 50% OFF all $1 book selections! Don’t forget to stop into your local NDC and get yours along with your FREE 3 Rivers Comicon Preview Guide so you can see what all the hoopla is about! ← Giant GI Joe Collection Now at Century III!